Brian Solis’ Engage! is a great study of the current social media landscape. For those who are sold on the importance of businesses engaging on social media platforms, it takes things a step further by looking at the tenets of the business world, like customer relationship management, social media policies and standards, and vendor relationship management. Solis approaches social media keeping sociology, anthropology, and ethnography in mind. Similarly to Groundswell, Solis emphasizes the importance of a strategic approach to social media: just joining in order to establish a presence is not just elementary, but a recipe for disaster. He emphasizes that social media is used not just to reach out to customers, and not just to reach out to potential customers: focusing on Social Relationship Management (SRM) is what it boils down to. Just like in Groundswell, Solis celebrates the end of traditional media as the gatekeepers to communicating with the public. One thing that Solis’ book excels at is the organization of social media– both visuals and lists help to explains sometimes complicated theories. There are many useful lists and outlines in the book– a collection of four P’s and four C’s as adaptations of the marketing mix, a list of social search tools, and an outline for corporate social media policies, to name a few. 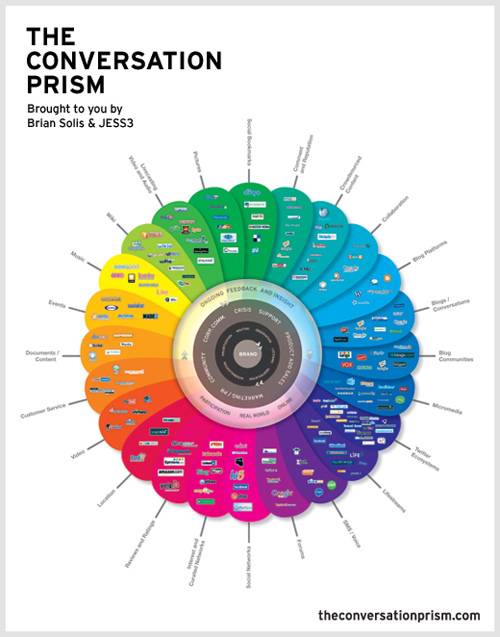 Anyone who has dabbled with social media strategy has seen the Conversation Prism, but I had never thought about who to attribute it to. I enjoyed actually reading an explanation of it, because my previous encounters with the prism were more of a demonstration of the complicated nature of social media. Solis’ Conversation Prism helps to map “the conversation” by cataloging social networks within certain categories (i.e., social bookmarking, blog platforms, and forums). The epicenter of the prism is the organization, which must listen, strategize, and execute social media tactics. The second circle is the workforce, which represents the fragmented nature/reality of social media within very large organizations, where different departments (i.e., customer service, marketing, and PR) will require varied involvement in an organization’s social media activities. The third circle is the actual conversation: where the interaction and engagement actually takes place. What I learned from the Conversation Prism is emphasized throughout the book: various factions within a large organization will want to participate in social media activities, and they all have legitimate reasons to do so. Without a central “hub” or group to facilitate that participation, fragmented communications will become a reality, only diluting the potential power of social media rather than harnessing it. One thing that really spoke to me in the book that helps to address this challenge was Solis’ example of Intel Insiders, their social media board of external advisors that serve as a sounding board and a guiding force. This is definitely something that Mad River Glen and other organizations should consider when developing social media plans. Cognitive diversity is pronounced across social media platforms, and people outside of the company with varying experiences and expertise can serve as a mini focus-group and produce a wealth of ideas. Beyond the social media board of advisors, there are several important lessons for Mad River Glen in Engage! For example, rather than segmenting the What’s New page of their website by social media platform, they could use a tool like FriendFeed to develop a lifestream, which would integrate updates and provide more of a realtime look at what’s going on across different platforms. In several places throughout the book, Solis mentions transitioning the online relationship to real life. For Mad River Glen, this would be a breeze– anyone who is engaging with them on social media is likely to be a skier. Using Meetup.com could help facilitate this. Overall, I found Engage! to be similar to social media itself in that it was disorganized and a bit overwhelming. At times, it felt like I was reading a series of diary/blog posts rather than a sequential book. At the same time, underneath the somewhat confusing and overwhelming surface of the book, Solis shared some fantastic insight and demonstrated his clear knowledge of the social media realm. Despite some shortcomings, I think the book is an essential read for any social media pioneer within a large or small company– from defining ROI to establishing a conversation index, Solis’ expertise is worth sharing.